Great half-hour long documentary exploring the 'Adult Fan of Lego' community, available in HD on Vimeo. Awesome. Call and response hidden messages in Super Mario Galaxy and Super Mario Galaxy 2 boxart. This past fall, almost 9 years after my younger brother Chris was killed in a traffic accident, my parents and I finally worked up the nerve to clean and organize the contents of his room. Among the various treasures we uncovered was a cache of Video games. 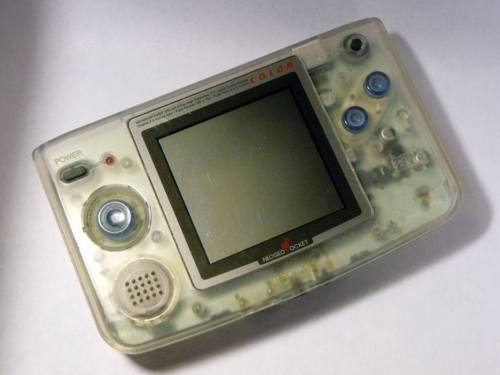 My brother was always a fan of portable gaming – he had acquired a literal stack of Gameboys of all shapes and sizes, and during the last year of his life he had tracked down a Neo Geo Pocket Color – a Japanese technological wonder that (like most non-Nintendo handhelds) never captured the market share its creators were hoping for. It occurred to me as I shuffled through the games and systems that a few of them probably had Chris’ data saved in their memory, and sure enough – they did. Two games – one on each system – still had his progress saved when I fired them up, and it was a uniquely weird experience to be confronted with these screens. The screens I was presented with displayed the status of his unfinished games. Playing beyond the data selection screen would allow me to alter the record that he had last written to memory. While there is probably a very inspirational book buried in that experience (“How I completed ‘Pokemon Red’ in my brother’s memory”) , I ultimately chose to leave the data as he left it. So yes – a weird experience. Then we found the Gameboy Camera. 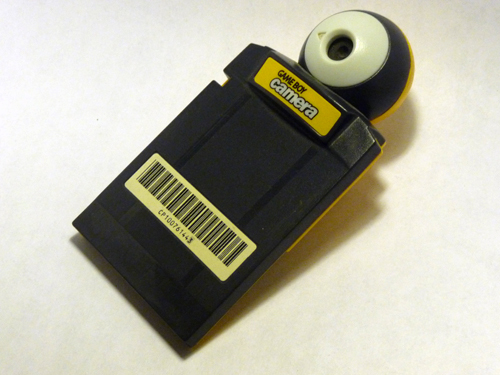 The Gameboy Camera was released in 1998, and plugs into the gameboy like any other cartridge – but with a spherical camera protruding from the top. The camera itself swivels 180 degrees, so you can either shoot what you’re seeing or turn it towards yourself and shoot self portraits. 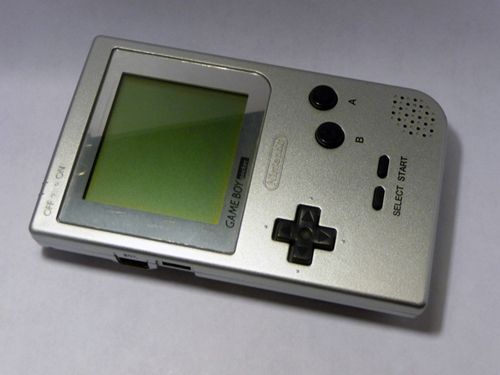 The internal memory of the cartridge has space for 30 blocky, greyscale photos (The photos it produces are 128×112). Apparently, the cover of Neil Young’s “Silver & Gold” was shot with a Gameboy Camera. 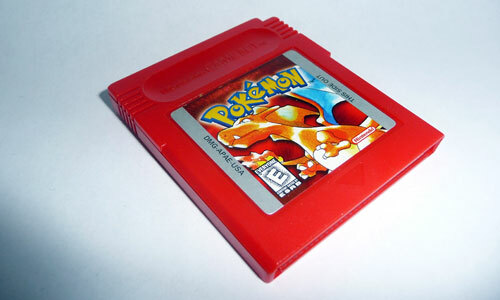 When I plugged the cartridge into a Gameboy and fired it up, I found twelve photos, still saved in memory. Of those, six were identifiable (Chris’ photography habits often trended towards EXTREME macro), and among them were what I can only assume to be some of his last photos he took. I did a bit of search engine hunting and it looks like I’ve found a way to get these images dumped to data. If anyone knows of a way to extract dates from Gameboy Camera photos, get in touch! I did a little bit of googling to see if other people have written anything about this, but the recent spate of zombie games has made searching for anything dealing with savegames of the deceased pretty futile. The only other reference I’ve seen is the comic strip below, which I originally found via Matt Hawkins at Fort90. It’s a translated version of a strip that was somehow spawned by Korean gaming site thisisgame.com – the original (untranslated) strip can be found here. I’ve posted it in its entirety here because I don’t know the source of the english translation. It is a great, great story perfectly adapted into a comic strip. I was six when Goldeneye came out for the 64. My dad would always convince my twin sister to come play it with us, and she loved it despite not liking video games. Because we were young, dad insisted we play with paintball mode on. 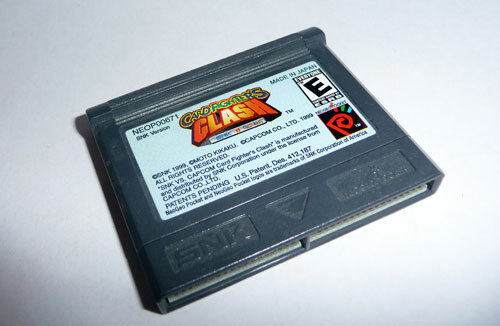 We played for hours and hours. When we were 8, mum and dad divorced. Everytime we visited Dad, we plaved some Goldeneye. The next time I saw him was 2 days later, in an intensive care unit, after he’d hanged himself and been cut down. They turned off the life support the next day. Tamsin and I made a point of finding ways to honour his memory every year, but it somehow was never good enough. I normally never show emotion about it- hell, Tamsin and I joke about it a lot. But I remember, last November 18th, I woke up early, and went and hugged my sleeping sister. “I miss him”, I whispered, and we both cried for hours. Then, we got up, and I went to my room. I dug around in some boxes, and blew the dust off my 64, and Goldeneye. We sat on our couch, and played together, with a non moying third player in the bottom left screen. Not seen in this video: The rapid-fire, high-pitched volleys of “HI!” that occurred when she was being repeatedly ‘next’-ed by other chatrouletters. "Deedee! What are you doing in my lah-boar-ah-tory?!" A few weeks ago, our Wii died. I called Nintendo, spoke with a representative, and ended up taking advantage of their Repair service. All told, it would be out of commission for approximately ten days. Clearly, this is a sad thing. For my wife Sarah, however, this was TRAGIC, because it meant no Dr. Mario until the Wii returned. Sarah’s economical solution to this unexpected drought was to buy a used Dr. Mario cartridge for the original Nintendo Entertainment System on eBay. Once it arrived, I was enlisted to dig the NES out of the basement and hook it up in the living room. For the next week or so, our regular Dr. Mario battles occurred in blocky 8-bit graphics at an incorrect aspect ratio. Once the Wii arrived back safe and sound, we still had the NES hooked up, so I pulled out my copy of Ninja Gaiden – my favorite NES game as a wee Kempy, and one that I had never beaten. Because Ninja Gaiden allows unlimited continues but offers no saving mechanism, my plan was to power on the NES, start playing, and leave it paused and powered up overnight until I beat the last level. This began on Sunday, January 31st. By the time I paused it and walked away on that Sunday, I was in level 6-1. I played for a bit after work on Monday, and made it to stage 6-2, where I got stuck for days. Four days, in fact. I spent bits of time on Monday, Tuesday, Wednesday, and Thursday practicing the same stupid level, timing out crazy jumps, and cursing the eagles. By some fluke of luck, I (barely) beat 6-2 on Thursday, and I was naturally SUPER EXCITED. I think I freaked Sarah out by how excited I was. I DID IT. Z: my question is: how’s 6-3? So a few times over the next week, I would pick up my 6-3 game, playing through the level, figuring out exactly what to do for each bit of the stage. It felt like memorizing a dance, and it occurred to me that maybe this crazy, precise, focus that you had to develop to make it through the final challenges of the game were intentionally rote and Ninja-like. At first I dismissed the idea as ridiculous, but the more I think about how much sinister thought went into the final levels (6-2 features several places where you need to intentionally get hit to avoid falling, and the ideal weapon for 6-3 appears at the very beginning – the player has to resist accidentally picking up anything else for the entire stage), maybe there’s something to it. Anyway, today, Sarah was out of town, and I had a bit of time to kill, so I decided today would be the day. I made it through 6-3, ran through the boss door… and was pretty much immediately destroyed. No big deal, right? I made sure to have two extra lives in reserve! But actually, what I didn’t understand was: dying AT ALL during the final battle sends you back to 6-1, extra lives and all. So, I did what anyone in this situation would do: watched the final battle and ending on Youtube (Part one, Part two, Part three) and got back to my weekend. I was deliberately NOT previewing things on youtube before playing through them, and after seeing those boss fights, I would have had no idea what to do. Stupid Jaquio. I finally powered the NES off, two weeks later. As I posted earlier, this week’s New Yorker magazine features four unique covers, one each by Alt Comics giants Chris Ware, Dan Clowes, Adrian Tomine, and Ivan Brunetti (You can view them all here). According to The Beat, New Yorker Art Director Françoise Mouly let slip that there is a secret message hidden amongst the covers. I spent a few minutes Googling the fragments of an address that appear in Tomine’s panels before giving up and checking the comments to see if anyone had figured it out (The address is that of The New Yorker’s Offices). An eagle-eyed reader of The Beat almost immediately identified that placing the four covers together creates a large image of New Yorker mascot Eustace Tilley, but even knowing that the image is there, it’s very subtle. I’ve rigged an image of Eustace Tilley to overlay the four covers whenever you mouseover the image below. Switching back and forth between the overlay and the covers reveals some of the finer details of the disguised image: I particularly like how the scattered papers in Ware’s cover become fingers. An apparent break from the anniversary tradition of a reimagined Tilley illustration, instead offering an imagined ‘origin story’ for the first Tilley cover. The whole of the story itself ends up being the Tilley cover. Ware wrote up a nice appreciation of Rea Irvin (Creator of the original Eustace Tilley image) here. Update: I’ve created a higher res version with opacity capability here. Chris Ware on his contribution to the collaborative Eustice Tilley ‘Origin Story’ that plays out on four seperate covers to this week’s New Yorker. A unique cover each by Ware, Dan Clowes, Ivan Brunetti, and Adrian Tomine. Supposedly there's a secret message hidden amongst them as well. A book dealer’s observations on the pricing insanity that follows a celebrated author’s death. Giant Robot Magazine Needs Help. Easily my favorite magazine for the last 10 years or so.